A Syrian Kurd holds a picture of Sheikh Mohammed Maashuk Khaznawi, the Kurdish Cleric and Political Leader who was found dead three weeks after being detained by authorities. Several thousand Kurds had demonstrated on Sunday in Qamishli demanding to “know the truth” about the killing of Kurdish cleric Mohammed Maashuq Khaznawi, Kurdish officials said. Tension has been rising since the burial of the prominent Kurdish cleric last week who locals believe members of the intelligence service killed. The cleric’s death had been announced last Wednesday by a Kurdish political leader, following his disappearance on May 10. The demonstrators wanted to march through Qamishli, the northeast Syrian town 680 kilometres from Damascus where the cleric was born, but were prevented by Syrian security forces, said Aziz Daud, head of the Democratic Progressive Kurdish Party. 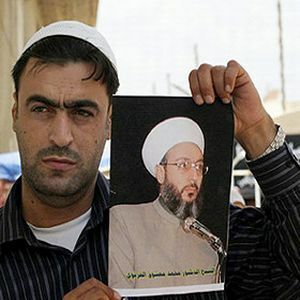 “Security forces arrested two members of this gang which carried out the crime of kidnapping and assassinating Sheikh Khaznawi,” who was buried on Wednesday, said the Tishrin government daily. It named them as Yassin Matar Hindi, 43, a Damascus employee of the state electricity authority, and Mohammed Matar Abdullah, 36, prayer leader of a mosque in Hassakeh, northeast Syria. Several banned Kurdish political groups in Syria, which has an estimated two million Kurds, demand the right to teach their language. They also demand citizenship, which is required for state education and employment, for about 200,000 Kurds classified as stateless based on a 1962 survey. Three Kurds belonging to another banned faction were sentenced to 30 months in jail in May on similar separatist charges. Hundreds of demonstrators have rallied outside Syria’s feared state security court, chanting for freedom and demanding an end to the 42-year-old state of emergency. “Long live liberty,” the protestors on Sunday chanted in Arabic and Kurdish as the trials of three Kurdish activists got under way. “We want democracy … End the emergency laws”.